Of course it is the Solar Maximum. For those who don't know what that is, a quick primer. The Sun goes through solar cycles, approximately 11 years each, during which the Sun goes from high activity to low and back again. High activity includes sunspots and CME, ie solar flares. Where this solar cycle has been positively sleepy, NASA was hoping for more action so they could blame the Earth changes on the Sun, something the Zetas predicted long ago. In 2009 NASA painted the picture of the Sun about to explode in 2012, as noted in Issue 127 of this newsletter on April 5, 2009. After predicting a solar Apocalypse in 2009, what occurred? 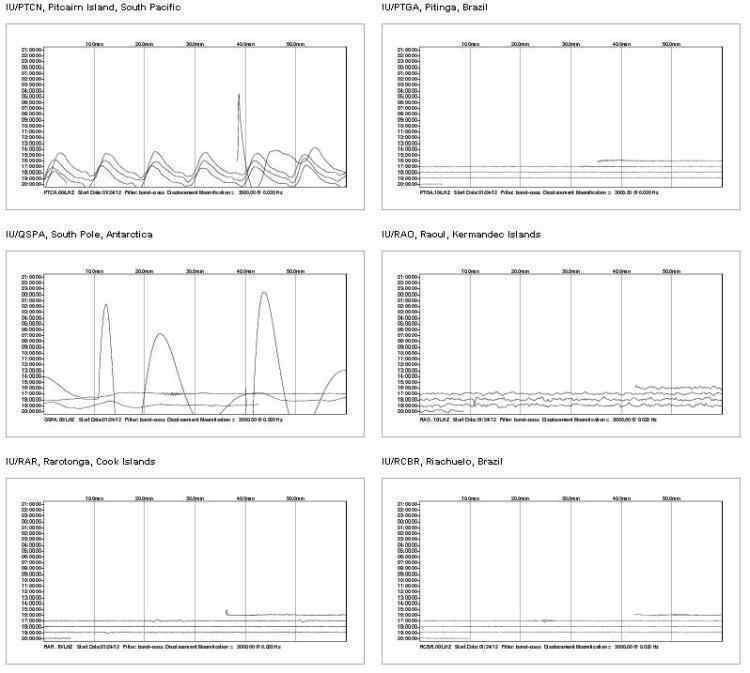 A very sleepy solar minimum continued, with record low sunspot activity, as detailed in Issue 152 of this newsletter on September 27, 2009. The sun is at a low point of a deep solar minimum in which there are little to no sunspots on its surface. In July through August, 51 consecutive days passed without a spot, one day short of tying the record of 52 days from the early 1900s. As of Sept. 15, the current solar minimum ranks third all-time in the amount of spotless days with 717 since 2004. Desperate to explain the moaning and roaring Earth, the exponential increase in earthquakes, the sunrise and sunset out of place for much of the world, NASA has once again reached back into their grab bag of tricks to bring forth the Sun. Their statement - "strongest radiation storm in 7 years". Well of course this is the case, as 7 years ago the sun was in the midst of a solar minimum. But compare the current solar activity registering on the SOHO images of the Sun to a CME from 2000, during the last solar maximum. A powerful solar eruption is expected to blast a stream of charged particles toward Earth tomorrow (Jan. 24), as the strongest radiation storm since 2005 rages on the sun. Sunday's solar flare was rated an M9-class eruption, which placed it just on the verge of being an X-class flare, the most powerful type of solar storm. M-class sun storms are powerful but mid-range, while C-class flares are weaker. ZetaTalk Comment 1/28/2012: Poor NASA, reaching into their bag of tricks and finding so few left, and what is there, broken. They had planned for a decade to blame the Sun for all the Earth changes - electromagnetic disturbances, earthquakes from a heated and roiling core, signs in the sky from some type of never-before-seen aurora, and even weather disturbances from atmospheric heating. After all, the solar maximum was approaching, and they had control of the images from the SOHO and Stereo satellites. What could go wrong? What went wrong was that the Sun refused to cooperate! The entire solar cycle has been so sleepy as to be almost in a coma. Sunspot activity was almost nill, even though electromagnetic disturbances were taking down planes such as Air France 447 and blowing up hydroelectric dams with run-away generators. But they are failing so miserably in their war against public awareness of the Planet X complex that they are milking their old schemes. Thus we have the ridiculous headlines about this anemic sunspot and CME being the "largest in 7 years". Of course it is the largest! That was the solar minimum, and this is supposed to be the solar maximum. What next? The Internet has been under assault lately, as this is the greatest threat to the cover-up over the presence of Planet X. On whatever excuse, give corporations bringing frivolous lawsuits the right to kill a domain or cut off contact to a threatening website. Of course, this was packaged as protecting the work product of corporations and artists. But by a corporation putting on the cloak of a Plaintiff, by the casual conclusion of someone in the Department of Justice, access to sites such as ZetaTalk or the Pole Shift ning could be killed, just like that. That was the threat. The bill in the House was the Stop Online Piracy Act (SOPA) and in the Senate, Protect IP Act (PIPA). White House has raised concerns about anti-piracy bill. The U.S. House of Representatives will resume work next month on a controversial bill aimed at stopping online piracy of movies, music and other content. The debate escalated when White House officials raised concerns that the legislation could make businesses on the Internet vulnerable to litigation and harm legal activity and free speech. Under the proposed legislation Web sites big and small could be responsible for monitoring all material on their pages for potential violations - an expensive and complex challenge. Current law requires Web sites with copyright-infringing content to take it down if copyright holders ask them to, leaving the rest of the site intact. Google, which owns YouTube and other sites, received five million requests to remove content or links last year, and it says it acts in less than six hours if it determines that the request is legitimate. Legislators have already agreed to delay or drop one ire-inducing component of the bills, Domain Name System blocking, which would prevent access to sites that were found to have illegal content. Was the protest successful? Legislators in both the House and Senate backed away from this hot potato, dropping it with a thud. Per the Zetas, the protest was primarily led by companies that would bear extra expense policing the web, but the effect is the same. SOPA and PIPA are dead. Corporations are now chasing copyright violators around the globe, with arrest warrants, what they should have done in the first place! Congressional support for controversial online piracy legislation eroded dramatically in the face of an unprecedented online protest supported by tech titans such as Google, Wikipedia and Facebook. ZetaTalk Comment 1/21/2012: We have predicted that despite many in the elite wishing to block or control the Internet, that such efforts will fail. The primary reason for such failed attempts is the broad use of the Internet in commerce and industry, and by government agencies including the Defence Department. Then there is the nature of the Internet itself, which is by design able to pass around any blockage, finding many routes. If cables are cut, data packets are sent via many other routes, and where they may arrive a few seconds late, they do arrive as expected. The least reason for failure of any martial law control of the Internet is public outcry, but this appears, at least on the surface, to be the reason for the failure of the SOPA legislation. But we should keep a watchful eye for threats to the Internet, as one amendment to Senate Bill 1867 shows. One amendment seemed to pass without issue: Senator McCain's amendment to provide for greater cyber-security collaboration between the Department of Defense and the Department of Homeland Security. In other words, not only is all of the United States a battlefield, but so is the Internet. Still not at its peak, but progressing, as one can see from a snapshot on January 26, 2012. Quakes registered not only along the Andes, but out in the Pacific, as shown on the IRIS chart for the day. A buoy just off Chile pulsed for days, as shown on the buoy map. 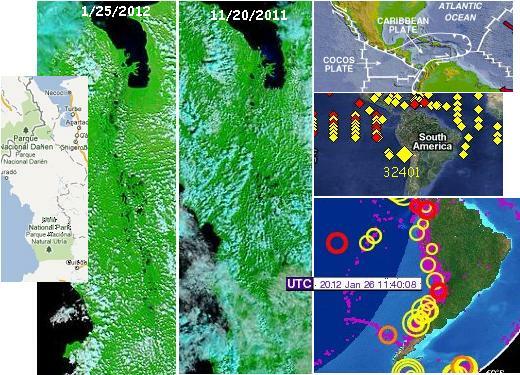 And the MODIS satellite images show Panama clearly being severed from Colombia. Enjoy all this proof of plate movement while you have it folks, as the establishment, the cover-up, is liable to blind you by removing access to such proof in the future. News reports from the stretch zones are likely to still be available, but in future, perhaps increasingly restricted to be only local news. What is important, from the establishment point of view, is that you remain dumb about what is coming. They don't want your messy panic! They know, they are preparing, but you are to remain dumb. That's their priority. 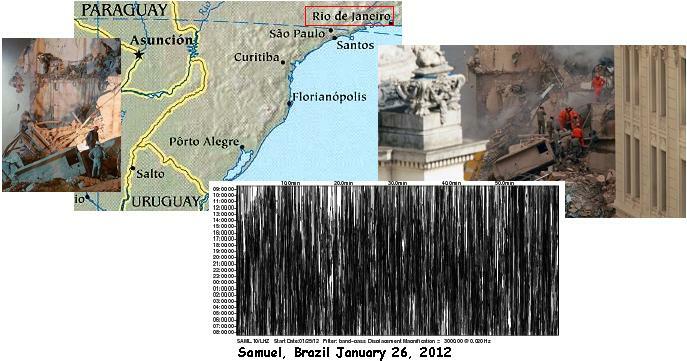 Meanwhile, the eastern coast of S America, in the stretch zone as S America pulls to the west, has imploding buildings. Three buildings collapsed: a 20-story building, a 10-story building and a smaller building of three or four floors. 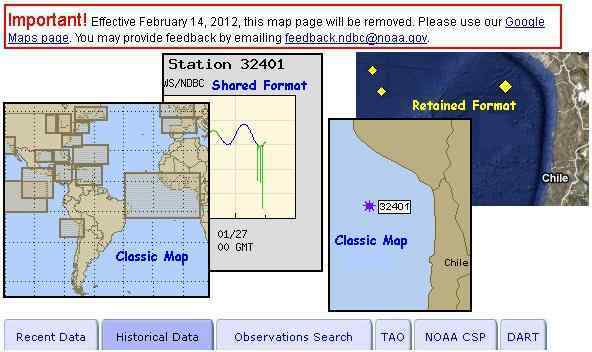 The National Data Buoy Center has posted that effective February 14, 2012, classic map pages will be removed, essentially reducing a plethora of ways that buoy data can be accessed. Per the Zetas, they are trying to reduce access to a single access point, the better to manipulate data in a coordinated fashion. ZetaTalk Comment 1/28/2012: Why blind the public? Of course it is because they hope to make it difficult to track the plate movements, identifying where and when they occur. Reducing multiple programs that provide data to the public makes it easier to manipulate the data. The cover-up wants all data sources to be in step, flawlessly. This is all too-little-too-late, of course, as the plate movements are no longer debatable, no longer needing statistics or sensitive instruments presenting graphs as proof. The plate movements are arriving in the homes of the snoozing public as moaning Earth, a Sun rising or setting in the wrong position, earthquakes that rattle their homes but are denied by the USGS. The public in general does not go to these US sites, such as buoy maps or live seismographs. They don't even know they exist. What they do is access the Internet, which the establishment would love to shut down, but as the SOPA disasters shows, cannot. As noted on this Pole Shift ning blog, the live seismographs were also again "adjusted" by a software upgrade. The USGS has of course been caught numerous times downgrading the magnitude of their quakes, dropping quakes from their databases, and reducing the sensitivity of the live seismographs. Case in point is this downgrading on July 29, 2003, where they were caught in the act. They likewise look for coordinated control over how the public receives earthquake data, as multiple data sources can reveal a lie. The heliplots you asked about should all be in place and looking 'normal'. have a couple of bugs to work out. Thanks for your interest. Beyond reducing the public's access to data, so a coordinated lie can be issued, is control over the media so the public does not connect with Earth changes. If coastlines in Europe are being assaulted by back-to-back hurricane force winds, the media will call this anything but a hurricane. Are the media networks purposely neglecting and/or deliberately minimizing the "extreme wind storms" in the UK and other parts of the globe? These events are technically not considered hurricanes due to the lack of hurricane atmospheric shape and the lack of rotating dynamics generated by Coriolis effects. Yet these "wobble-generated" windstorm events are reportedly exhibiting Category 1 and Category 2 Hurricane wind speeds in the range of 73-112 mph. ZetaTalk Comment 1/28/2012: This practice has only recently been instituted by the cover-up, as prior to this such storms were occasional and blunting the impact of this news was done by referring to such storms in the past. Now that the incidence of North Atlantic storms assaulting Europe could best be described as "back-to-back hurricanes", the term "hurricane" is removed from the verbiage allowed. A timely post on the Pole Shift ning reminded me that we had not covered the increase in albinism since July 15, 2007, on Issue 32 of this newsletter, when a pink dolphin appeared. 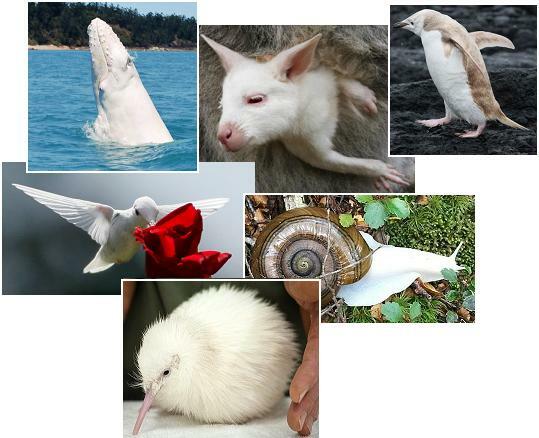 The Zetas predicted that increasing albinism would occur due to the roiling core, which responds to the approach of Planet X.
ZetaTalk Explanation 6/15/1996: Albinos occur naturally in all life forms, some with more rarity than others. What causes an albino to emerge is assumed to be a genetic quirk, where the normal production of color compounds is suppressed. This is the effect but not the cause, else why would life in dark caverns or the depths of the ocean be pale, without color? If color were a genetic quirk, then why the almost total absence of color in creatures living in darkness? Coloration is influenced by radiation, just as tanning takes place upon exposure to sunlight. What is little understood is that this phenomena has two switches, one increasing coloration under certain radiation frequencies, but another reducing coloration under a different set of radiation frequencies. The core of the Earth, emitting in greater bursts the radiation her caverns and deep water creatures are bathed in, is confusing her surface creatures. Thus, the White Buffalo, heeding the signals from the restless Earth, are heralding the approaching pole shift. Now there seems to be a virtual explosion in albinism. A Kangaroo on September 18, 2009. A Hummingbird a year later on September 28, 2011. A Humpback Whale on October 6, 2011. An albino Snail of all things on November 30, 2011. Another white Dolphin on December 2, 2011. An adorable albino Kiwi chick on December 28, 2011. And a Penguin on January 15, 2012. The pace has picked up!